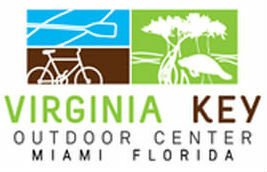 Virginia Key Outdoor Center (VKOC) is a full service outdoor recreation center. It offers equipment rentals, lessons, private and group tours, corporate outings, private parties and the best kayak and paddle board tours in town. VKOC has Miami's only mountain bike trails. Rentals are available daily so you can experience a stress free outdoor adventure seven days a week. Guided and self-guided outings are available year round. Winters are spectacular with herds of manatees inhabiting their little lagoon. Starting late 2018 visitors can enjoy these giant sea mammals from one of our clear canoes. It's like a glass bottom kayak adventure just for you. Summer brings bio-luminescent organisms to our waters. Enjoy and evening paddle where you can see stars in the sky and stars in the water. Independence Day and New Year's Eve are special at VKOC. With nearby fireworks on display they have the best secret spot. Join the celebrations with BBQ, live music, and fireworks you can watch from your kayak or paddle board. Beach viewing is also available. These are must do events. Located on a tranquil lagoon, adjacent to the ocean we are Miami's premier outdoor destination. It is your in-town gateway to the outdoors. The nature viewing is exceptional. Virginia Key, boasts of pristine coastal trails with highly endangered flora. A hammock nestled among an urban metropolis, this island presents opportunities for residents and visitors to connect to the outdoors and Miami’s history. Opening pathways to nature – take a guided walk on a nature trail, paddle above manatees gracefully swimming in the gentle lagoon current, Virginia Key Outdoor Center is magical place within minutes of the city. With miles of trails and surrounded by water you can bike, paddle, run, or walk. Kayak fishing, swimming, snorkeling are only footsteps away. Don't leave without visiting our snack shop with cold drinks and delicious treats. And as an added bonus and rarely found in a park - showers, and clean air conditioned bathrooms. Really! Come visit, become part of the VKOC family. Enjoy Miami's wilderness, it's near, it's right downtown. Slackline Acro-Yoga Fire Spinning and Flow Arts Jam!